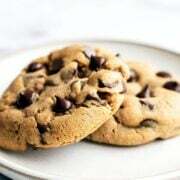 Peanut Butter Chocolate Chip Cookies are big, thick, chewy, and soft and loaded with peanut butter and chocolate flavor. They are outrageously good! No stand mixer required. Download my FREE Cookie Customization Guide here. Preheat oven to 350ºF. Line baking sheets with parchment paper. In a medium bowl whisk together the flour, baking soda, baking powder, and salt. In a large heat safe bowl, microwave the butter until melted. Vigorously stir in the peanut butter into the hot butter until well combined. Stir in the granulated sugar and brown sugar until well combined. Add the eggs and yolk, one at a time, stirring well after each addition. Add in the vanilla. Gradually stir in the flour mixture. Stir in the chocolate chips. OPTIONAL: If time permits, cover the dough in plastic wrap and refrigerate for at least 24 hours but no more than 72 hours. Let the dough sit at room temperature just until it is soft enough to scoop. Divide the dough into 3-tablespoon sized balls using a spring-loaded scoop and drop onto prepared baking sheets. Flatten dough slightly into disc shapes with your palms. Dot each disc with a few extra chocolate chips for picture-perfect cookies. Bake for 12 minutes, or until golden brown. Let cool for 5 minutes before removing to wire racks to cool completely. Cookies can be stored in an airtight container at room temperature for up to 3 days.